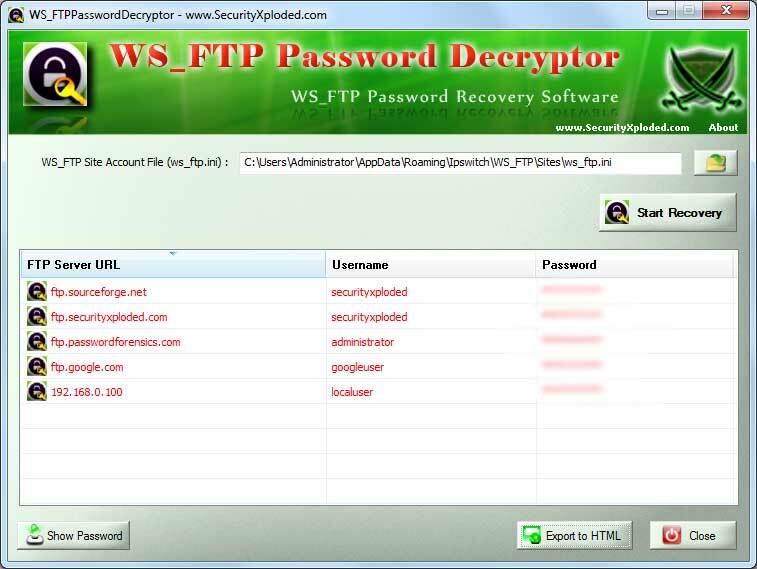 WS_FTP Password Decryptor is the FREE software to instantly recover FTP login passwords stored by WS_FTP - one of the popular FTP client application. WS_FTP stores the password for all the past FTP sessions in the "ws_ftp.ini" file so that user don't have to enter it every time. WS_FTP Password Decryptor makes it easy to quickly scan & decrypt all these encrypted FTP login passwords. It presents both GUI as well as command line interface which will be useful for Penetration Testers & Forensic investigators. You can either use it to automatically recover the stored passwords from local system or recover passwords from remote machine by manually feeding WS_FTP "ws_ftp.ini" file. It works on most of the Windows platforms starting from Windows XP to latest operating system, Windows 8. Instantly scan and recover all stored FTP login passwords from WS_FTP. Comes with both GUI interface & Command-line version. Useful for Penetration testers as well as Forensic investigators. Recover WS_FTP passwords from local as well as remote system. Save the recovered password list to HTML file for transferring to other system or for future use. 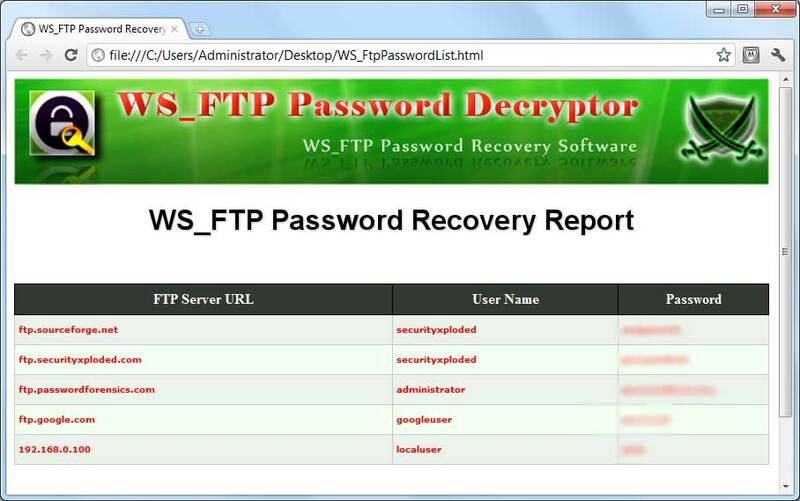 Screenshot 1:WS_FTP Password Decryptor is showing the recovered ftp login passwords. Passwords are not shown being sensitive data, you can turn on by clicking on 'Show Password' button below. Screenshot 2: Command line usage of WS_FTPPasswordDecryptor showing various examples. 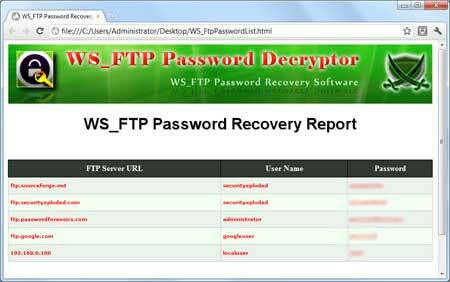 Screenshot 3: Exported list of of recovered ftp login passwords by WS_FTPPasswordDecryptor in HTML format.